In 1924, Steiner painted a watercolour of the Madonna and Child, giving it the title ‘New Life’. Through Steiner’s depiction of Mary, mother of the Divine Child, this painting draws us to the feminine expression of spirituality. In this highly-illustrated, full-colour book Angela Lord studies this feminine principle, beginning with the very earliest stages of human evolution – the ‘Fall’ from paradise and the pre-historic periods of Lemuria and Atlantis. From the Mysteries of Egypt and Greece to the development of Christian art, she offers insights to the myths and legends of female deities and goddesses. According to Rudolf Steiner, at the time of Jesus’s birth humanity had entered a decadent phase of development. Small groups of initiated individuals, however, were preparing for a sacred birth: the descent of a heavenly being into earthly existence. The God of the Old Testament would be revealed ‘in flesh’, born to a virgin mother. 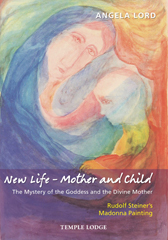 In the second part of New Life – Mother and Child, Angela Lord takes us on a journey through two thousand years of Christian art, covering Iconography, the Middle Ages and the Renaissance. We see how artistic images of Mary and her Child have changed, why these variations have occurred and how they reflect the changing consciousness of humanity. Finally, the ‘New Life’ painting is considered from the interactive processes of colour and composition, illustrated with a series of artistic colour sequences. ANGELA LORD is a painter, interior colour designer, muralist and art educator. Born in Christchurch, New Zealand, she studied with Gerard Wagner at the Goetheanum Painting School in Dornach, Switzerland. She founded the Columbine Art Academy in Sussex and London, which offers a diploma recognized by the Arts Section at the Goetheanum, and teaches around the world, most recently in China. Her publications include The Archetypal Plant: Rudolf Steiner’s Watercolour Painting, Easter: Rudolf Steiner’s Watercolour Painting, Colour Dynamics and two books on Creative Form Drawing.